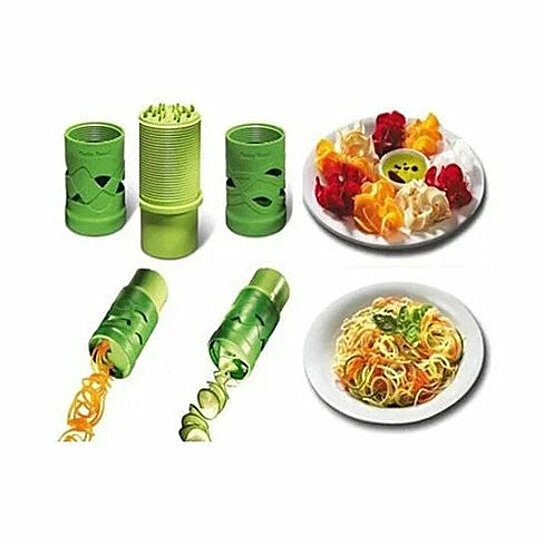 Veggie Magical Slicer And Salad Decorator.. Make your veggies fun to eat .. enjoy the vegetable like never before ..
Veggie Magical Slicer And Salad Decorator is safe and easy to operate like a child's play.. Simply take the piece of your favorite vegetable , fix it on the fixture pins and twist..
Make spiral shapes out of Cucumbers, Carrots, Sweet Potatoes and Radishes to make healthy salads and make spaghetti shapes out of Zucchinis to make raw pastas, peel Onions fast without cutting them through open sharp knife which is unsafe and makes you cry .. but those same Onions will make you smile when you twist them through the Veggie Magical Slicer And Salad Decorator.. Present your already delicious food by ALSO making it look delicious by decorating it in seconds like a professional chef with the Veggie Magical Slicer And Salad Decorator.. Handy tool , easy to use.